Phrenology was based on the theories of Franz Joseph Gall (1758-1828), an Austrian physician. He argued that the brain was divided into several distinct areas that performed particular mental or emotional tasks. The strength or weakness of those brain sections could be discerned by studying the shape of human skulls to provide an understanding of each person’s inclinations and abilities. In the 1830s, the theory was introduced to the United States, where brothers Orson and Lorenzo Fowler popularized it by “reading” people’s heads for a price. Many imitators took up the practice, and it remained popular in America throughout the nineteenth century. 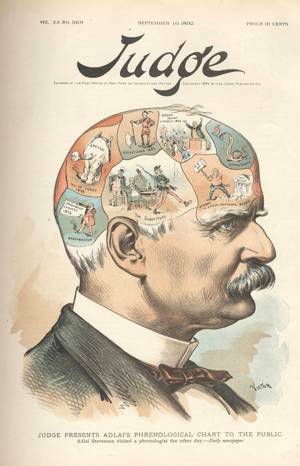 Phrenology sometimes merged with theories of biological determinism that depicted certain races and classes as mentally or morally inferior, although that was not the position taken by most practitioners.